Yoga can be a great way to find calmness in our hectic lives. Couple that with the beauty of the water and the gentle rocking of the waves, and you have a recipe for inner peace. It doesn’t matter if you’ve practiced yoga for a long time and are looking to venture out on the water, or are an avid paddler looking to stretch your way into yoga; you won’t regret it. Keep reading to learn all about the best SUP for yoga, how to choose one and an awesome SUP yoga routine! What Makes a SUP Good for Yoga? Not all SUPs are great for yoga, though. The best paddle board for yoga is going to have a few key characteristics. You want a 31”+ wide SUP for yoga to give you more room to work with. After all, a lot of positions require you to be completely sprawled out, so the more room, the better. Since you will frequently be lying or kneeling down on the board, you want a soft top. This is why inflatable boards work great for yoga; they are naturally softer than a fiberglass board. A thicker board with more volume will help add stability, which is HUGE when it comes to practicing yoga on the water. You also need to pay extra attention to the design of the board. You need a board with a wider nose, so you can properly do positions such as downward facing dog. Swimwear - For men, this would be any swim trunks that provide good flexibility. You don’t want them too tight or too loose so you can bend into your positions. For women, either a one piece or bikini will work. Rash Guard - These shirts help to not only protect you from the sun and are available in regular, 3/4, or full sleeves. I recommend full sleeves, though, to keep the sun off your skin. They’re breathable, so you won’t get too hot while you’re working up a sweat on the water. Water Safe/Slip Resistant Shoes - You need shoes that are slip resistant. Now, you can go at it without shoes on, however, if your board and feet are wet you might have a hard time not slipping in certain positions. Sunglasses - I always wear polarized shades when I am on the water. They prevent me from having to squint all day and ending up with a huge headache. Plus, with polarized shades you can see deep into the water which is awesome! There are some yoga companies out there that make clothes specifically for SUP yoga; I recommend you check out Jala Clothing. “The purpose of yoga is to create strength,awareness and harmony in both the mind and body,” explains Natalie Nevins. The relaxation brought on by Yoga has been knowing to help with chronic pain, reduce blood pressure, and even help with insomnia. It also works to fight off stress, which can have devastating effects on your body if not kept in check. The meditation and breathing exercises in yoga help to increase body self-awareness and creates mental clarity and sharpens your concentration. When you add Yoga into a sport like paddle boarding—which is already both relaxing and psychically demanding in nature—you increase all of these benefits 10x. When you take yoga to the water, you’re adding a whole new challenge to the practice. The waves make your body have to fight for balance, which only strengthens both your body and mind. But it’s so much more that that. SUP yoga helps you to get in touch with the world. It creates an opportunity to sit on the water in silence with just you, the earth, and your breath. If you can, I recommend you look into SUP yoga classes around your area. If you live in a big area where paddle boarding is popular, you aren’t going to find any shortage of classes. Made with the same high standards as every board in their line, ISLE’s take on a yoga SUP is a home run. Since it was designed with yoga in mind, it has a wide nose and tail design to give you a huge stable platform which makes no pose unattainable. Since this board is inflatable, it's soft top makes it great for someone just getting into paddle board yoga. It’s also one of the lighter boards you’ll come across—only 27 lbs—making it easy to transport to the lake from your car. The rail and deck mount system are great for holding your paddle while you exercise. It’s not just an excellent board for yoga, though. Since it has a wider nose, it makes a great SUP to train your dog to ride with you on! I would have liked this board to be a couple of inches wider. 31” is fine, but for a yoga specific board, you would think they would take the wideness of the board into consideration. Also, the paddle that comes with this board isn’t one you should take with you while doing yoga since it doesn’t float. This is an issue since you’re not going to have the paddle in your hands at all. At the end of the day, though, the ISLE Yoga is the best inflatable SUP for yoga. If you want to buy an inflatable paddle board from one of the most reputable and well-respected manufacturers in the industry, then you can’t go wrong with any board by Red Paddle Co. Finally, this past summer they came out with a model geared specifically for yoga/fitness. It’s only available in one size, but that’s all you’ll need. It’s 10’ 8” by 34” wide platform is perfect for doing yoga, and it’s also the most stable board you’re going to find. That can be said about any Red Paddle Inflatable SUP since, while their competitor's boards fill up to 15~ psi, Red Paddles pump up all the way to 25 psi! This extra volume does wonders for your stability. They also removed the center handle to make it more comfortable while you’re doing yoga. After all, no one wants a handle jammed into their back! Not only is the board very rigid and wide, but it also comes with an EVA deck that is a built in full yoga pad. This deck makes it comfortable to move around on and helps your hands and feet to grip on well. While when used for Yoga there aren’t any glaring flaws you could point out. However, since it was geared so heavily towards yoga and made 34” wide, it might be a little bit too wide for shorter riders that are looking for a SUP they can also use on long cruises. 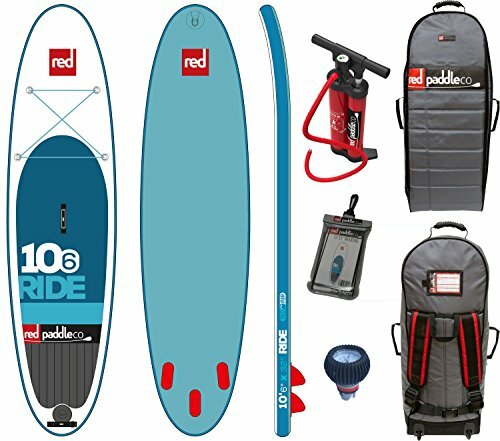 The Red Paddle Co. Ride might just be the best all-around inflatable paddle board there is period. Even though it’s not designed for yoga, it’s 32” wide body makes for a perfect platform for any pose. Red Paddle Co does a great job making extremely stable boards—that’s why just about every model they make is perfect for yoga. They do this but achieving a high volume, while still somehow keeping the board at only 4.72” thick. If you’re turned off of inflatable paddle boards because you have heard horror stories about pumping them up, you don’t have to worry about it when it comes to the 10’ 6” ride. Red Paddle gives you the industry leading Titan Pump with every SUP, which makes it super easy to air up—only taking 4-5 minutes. More versatile overall when compared to the Activ, since it was designed to be an everyday riding board. Since the board isn’t designed with yoga in mind, there is handle in right smack dab in the middle of the board. 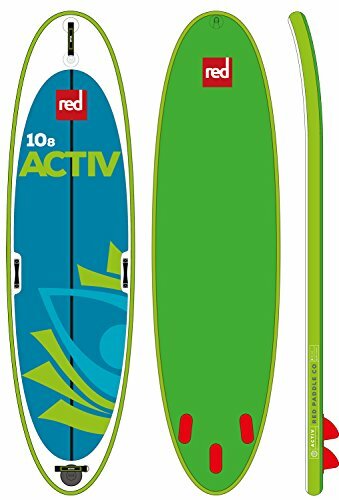 It does push into the board making it hard to notice, but it’s not going to give you that completely smooth feeling like the Red Paddle Co Activ does. There’s something about the bamboo look of the Montauk that just makes me want to jump on it and ride it off into the sunset. 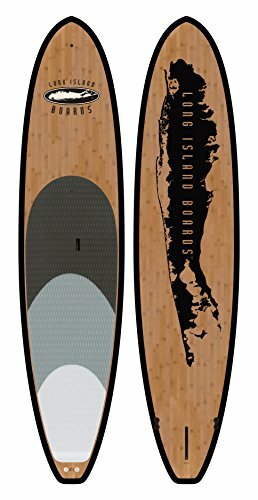 Made from renewable bamboo and carbon fiber with an EPS foam core, this SUP is super light weighing in at only 18 lbs. For comparison, that’s lighter that most inflatable paddle boards. The 32” wide board has a huge EVA deck pad making it comfortable when practicing yoga. The stability of this SUP is second to none. This 180-liter volume of the board help create a stable platform that will allow you to focus on your sun salutations while you rock gently with the waves. If you want to take family or pets out with you, It can support all the way up to 350 lbs thanks to the added buoyancy provided by the bamboo. The three fin set up allows you to either ride with one, two, or three fins at a time so you can control how it tracks through the water. The concave bottom creates less drag in the water that allows this SUP to glide on the water beautifully. One of the biggest names in the sport—SUP ATX—makes an excellent paddle board for yoga. 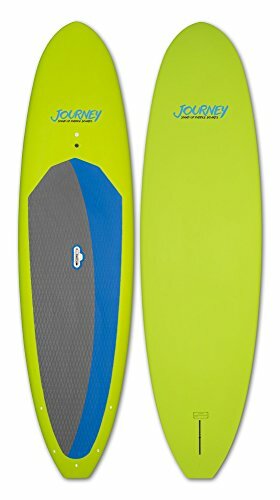 The Journey series is made with a high-quality EPS foam core with epoxy resin and carbon fiber rails. It’s 10’6” and 32” wide making it an excellent size for anyone to practice yoga on. The built in durable Memory Foam deck pad creates a super comfortable yoga mat and increases your stamina for casual riding as well since it's softer on your feet and legs. These boards have a front nose camera mount for a GoPro or waterproof speaker—which is great to add ambient music to help with your relaxation. You’ll also love how light this SUP is. Even though it’s a hard board, it’s only 27 lbs! 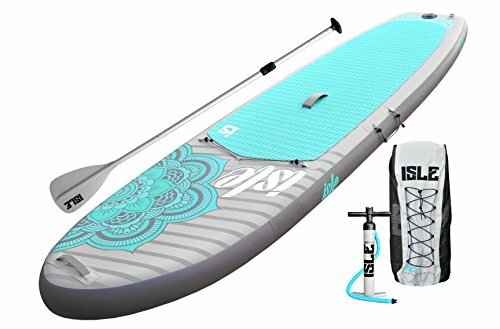 Since this SUP isn’t designed for yoga, it has plenty of features that make this a great cruising board as well: plenty of tie downs for gear, tracks extremely well and is easy to paddle. If you choose to go with the Journey SUP for yoga, I recommend you either be an experienced paddler or experienced in yoga. Granted, this board is softer and lighter than most epoxy SUPs, when it comes to falls; they are almost always going to hurt worse on a hard board. Finding the best paddle board for yoga doesn't need to be difficult. You should try and go with an inflatable at least to start because you might be falling a lot! Make sure to grab a wide board too. Using a SUP for yoga can be an awesome way to get your yoga on in nature, so what are you waiting for! Have you used any of these boards before? What do you think is the best SUP for yoga?